The Canon IXUS 255 HS is a joy to use. It's small and lightweight but has that presence of weight that gives you confidence that it's still in your possession. It's good looking enough to want to get it out at every opportunity when on nights out. There's enough modes and features on it to keep you entertained for hours and it has convenient features on it to help you get your pictures to a safe storage area. We found the menus are a breeze and well lit with contrasting dark grey and bright orange. There are only two small gripes: The buttons are maybe a bit too small which is a sacrifice you have to make if you want a small camera. Also the battery door is a real metaphorical thorn in a garden of roses. It's badly made from flimsy plastic and has no lock. Arguably not essential, but it sticks out against the rest of the camera like a green hat with an orange bell.. Image quality is exceptional which we're putting down to the heady combination of a low(ish) resolution sensor and top of the line imaging processor. Noise is practically non-existent until you get to high numbers which is great. Colours are recorded faithfully with not too much saturation unless you choose it in the scene modes. iContrast works well to bring out more detail in shadowy areas. The Canon IXUS 255 HS seems a perfect little camera for stealing away on holiday when you want exceptional picture quality without lugging all your gear around. The 10x optical zoom will bring far away wildlife to a comfortable distance without spooking them or without you actually having to walk to them. 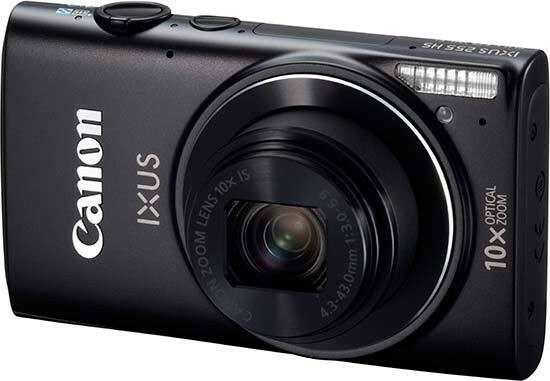 For the price, it's a great little camera and if you're looking for a slim unit that has a host of features, good build quality and produces excellent pictures, then you need to take a look at the Canon IXUS 255 HS.